Time to get back into my good habits and start cooking again and blogging about the weekly recipe. I made this WHITE CHOCOLATE AND LIMONCELLO FRIDGE CAKE for Christmas Eve. Delicious, very easy to make, no baking involved, and if you have read my post about how to make your own limoncello, then it will be a piece of cake (bad joke…). 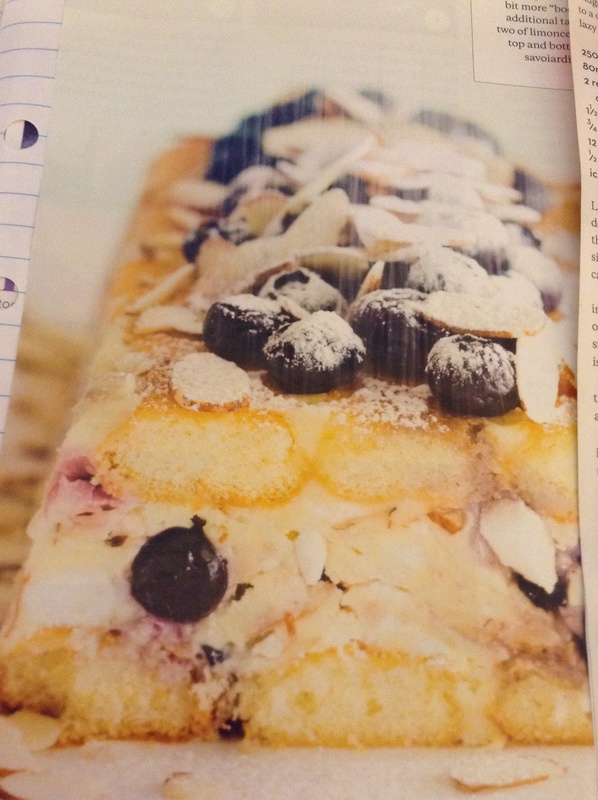 The recipe comes from Cuisine magazine (from New Zealand). It will serve 8 and it needs 6 hours of setting time. Line a 22cm × 11cm loaf tin with a double layer of plastic wrap, ensuring that there is a good overhang on all sides to help you lift the finished cake out. Put the chocolate and cream in a heatproof bowl over a saucepan of simmering water and heat, stirring often, until the chocolate is melted and smooth. Remove from the heat and stir in the meringues, 1 cup of blueberries and 1/2 cup almonds. Arrange 6 savoiardi biscuits in the base of the prepared tin (you will need to trim them slightly to get a snug fit). Drizzle with half the limoncello. Top with chocolate mixture then press the remaining savoiardi biscuits into the top. Drizzle the biscuits on top with the remaining limoncello, cover with plastic wrap and press down firmly. Refrigerate for at least 6 hours or until very firm. When ready to serve, use the plastic wrap to lift the cake out of the tin. Remove the wrap and place upside down on a serving plate. 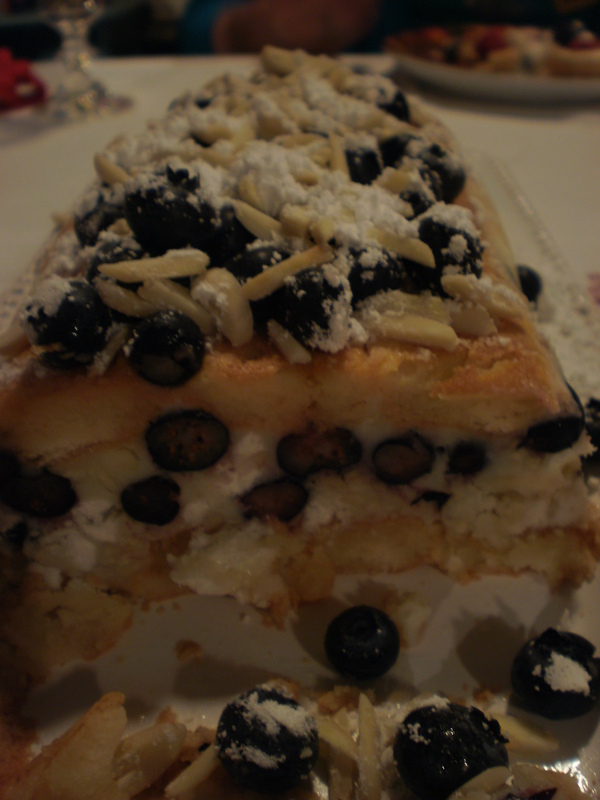 Top with the remaining blueberries and almonds and dust lightly with the icing sugar. Slice with a sharp knife. Keep in an airtight container in the fridge for up to 1 week. Baker’s note: This cake is only lightly sprinkled with limoncello – if you prefer your cakes a bit more “boozy”, add an additional tablespoon or two of limoncello to both the top and bottom layers of savoiardi biscuits. For me, I would have left the cake a bit less in the fridge to get a “softer” consistency (like a tiramisu) and then cut the cake in the tin.